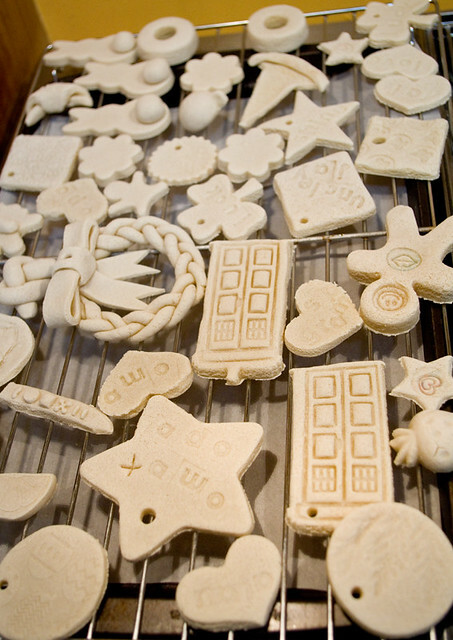 Rolling out the dough and cutting it out with cookie cutters and Play Doh cutters. Which you then knead together to create a stiff dough. You then cut out/shape your designs and lay them on parchment paper on a cooking tray. Advanced creations can take a long time, a lot of skill, and a great attention to detail. 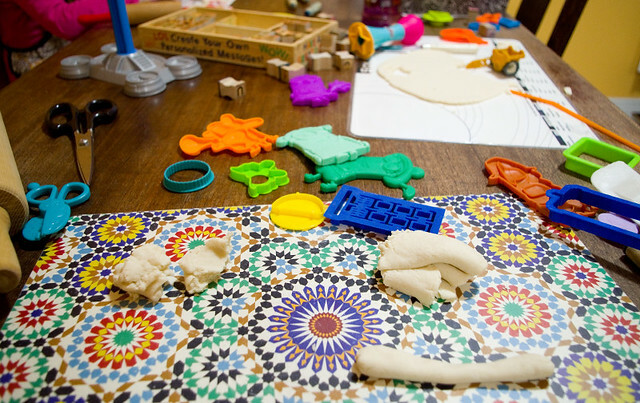 However, when you’re making crafts with younger children, quick and easy cookie cut-outs are the name of the game! As a bonus, since the dough is so cheap to make and is 100% biodegradable, if the kids proclaim themselves done after having made very few cutouts, it’s not too big of a deal. 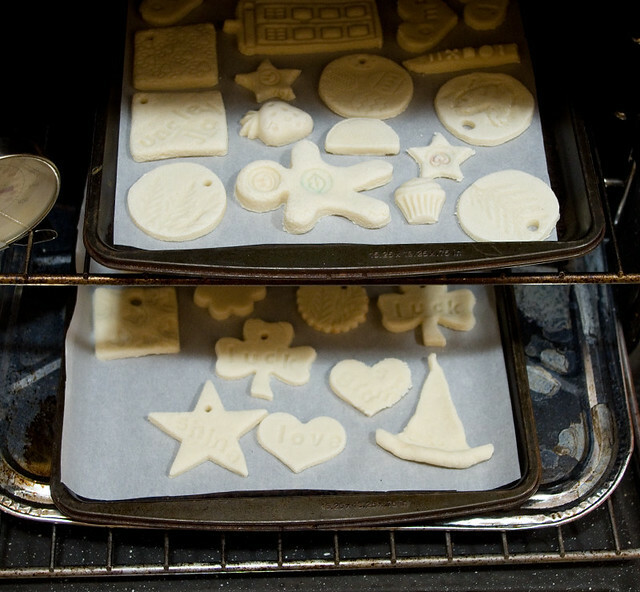 After shaping, you put the salt dough creations in the oven at 200°F (93°C) for… Well, that’s where directions vary. I think it all really depends on the thickness of the final pieces. I’ve seen it anywhere from two to eight hours, so I kind of guessed at three, which worked out okay. I think that what everyone agrees on is that you don’t want to bake or brown the dough, you just want to remove all the moisture. Then the cut-outs need to be cooled on a cooling rack, which doesn’t take all that long, really, since they weren’t terribly hot in the first place. We left them overnight to hopefully remove the last of the moisture. It’s not like you have to worry about them going stale, after all. Then it was time for paint! I have what seems like a million colours of acrylic and many different paint brushes, all from the dollar store. If you don’t have a stash of paint and want to keep costs low, stick with red, yellow, blue, black, and white. The kids can mix any colours they want with the primary ones, and it’s a good lesson in colour theory. To be honest, my girls ran out of patience with the fiddly details, so the painting will have to be completed another day. Since I had to make dinner, I didn’t get a chance to finish painting the ones that I made either, so we’ll have to sit down and do them all together tomorrow. I really liked how the ones with the impressions turned out, though. The girls used rubber stamps, carved rolling pins, and even leaves of plants to create textures. 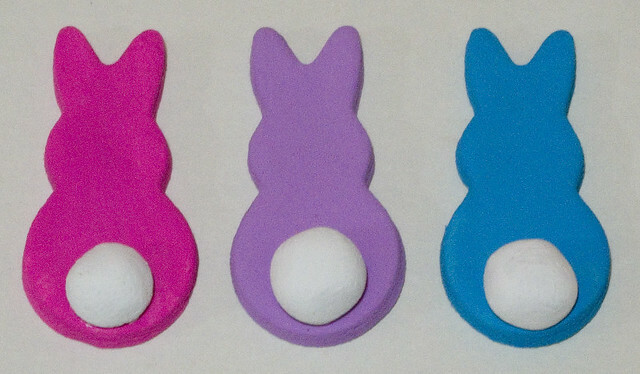 Of the ones that I painted, I am particularly happy some of the simplest: the Easter bunnies, made using a cookie cutter and a little ball of dough for the tails. The next step is to seal salt dough, which I’d prefer to do with spray-on acrylic, so that will probably have to be done out in the garage once it warms up a bit. I’m told it can also be done with Mod Podge or PVA glue, both of which I own, but I’d like to test them first to see how badly they smudge. 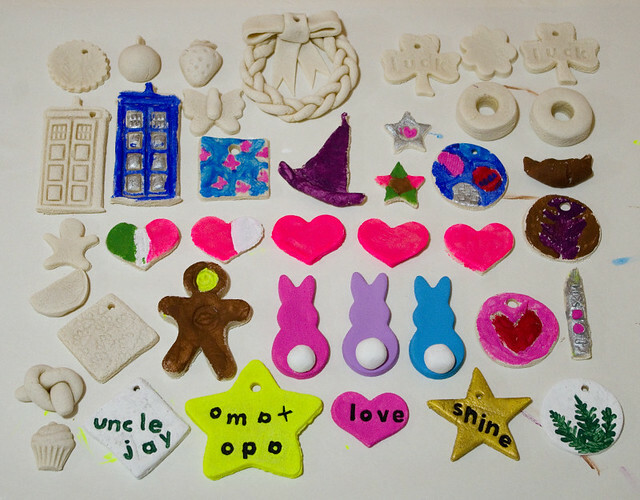 Then the ones with holes will become ornaments, and the ones without holes will have a magnet (also from the dollar store) glued on the back to become fridge magnets.